A little over a week ago, I shared the very first grapefruit recipe on this site. To quickly recap, prior to trying those cookies I was firmly in the hater camp when it came to grapefruit. And though I loved the cookies, I didn’t really think I’d be developing a serious addiction to grapefruit anytime soon. I even chuckled when Shawnda commented that the cookies were the “grapefruit gateway” and that I’d soon be hooked. No way, not me. I always grab a few lemons or limes when I’m grocery shopping – you know, just in case I want to bake something. But over the past 2 weeks, I’ve walked right past them, stopping instead to load my cart with grapefruit. I’ve scoured my cookbooks and the internet for every grapefruit recipe I could find, and have been working my way through them one by one. Let’s just call it making up for lost time. I baked this grapefruit cake without any real expectations, but I wound up loving it so much I kept it all for myself. I was completely selfish, breaking my own rule of sending anything I bake to the office with Shane, my mom or Shane’s dad. It’s not a fancy layer cake, but this humble loaf packs a 1-2 punch – perfect texture and just enough grapefruit flavor to let you know it’s there. I’ve justified it for breakfast a few times, but it’s also great as an afternoon snack or late night treat. I’m sharing this recipe as part of my friend Di‘s blog event celebrating all things citrus. You can check out the other recipes or link up one of your own here! Preheat oven to 350 F. Coat 9×5-inch loaf pan with nonstick cooking spray. Whisk the flour, baking powder, and salt together in a medium bowl. In the bowl of a stand mixer fitted with the whisk attachment, rub the sugar and zest together with your fingertips until the sugar is moist and fragrant. Add the eggs to the bowl with the sugar mixture and beat on medium speed for about 3 minutes, or until the mixture is thick and the whisk leaves a trail. With the mixer running, add the milk, then the oil and finally the vanilla. With the mixer on low, add the dry ingredients, beating just until combined. Pour the batter into the prepared pan. Spray a small paring knife with nonstick cooking spray, then run the knife lengthwise down the center of the batter, about 1/2-inch deep. (This helps the cake develop an even crack down the center as it bakes.) Bake for 30 minutes, then rotate the pan and bake for another 30 minutes, or until a toothpick inserted in the center comes out with just a few moist crumbs attached. While the cake is baking, make the syrup: Combine the grapefruit juice and sugar in a small saucepan. Bring to a simmer, stirring to dissolve the sugar, then continue to simmer for 1 minute. When you remove the cake from the oven, transfer to a wire rack (still in the loaf pan). Immediately use a skewer to poke deep holes into the cake (about 3/4-inch apart). Brush the cake with the syrup, pausing as necessary to allow it to soak in. Keep brushing the cake until you’ve used all of the syrup. Let the cake cool for 10 minutes after you’ve brushed it with the syrup, then turn it out onto the cooling rack. Allow to cool to room temperature. 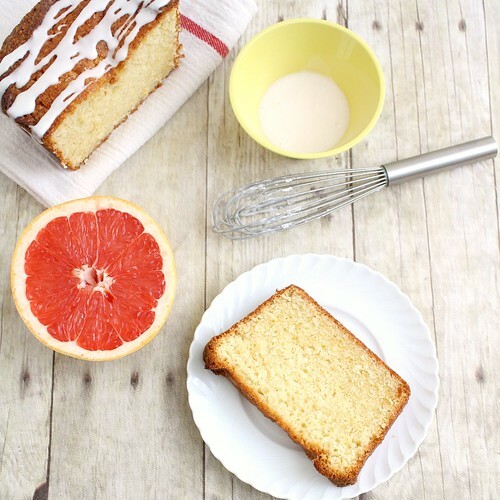 To make the glaze: In a medium bowl, stir the confectioners’ sugar and grapefruit juice together until the glaze is smooth – it should be thick but with a pourable consistency. Drizzle over the cake allowing the glaze to drip down the sides. Let the glaze set before serving. Well wrapped, the cake will keep at room temperature for 2 days. 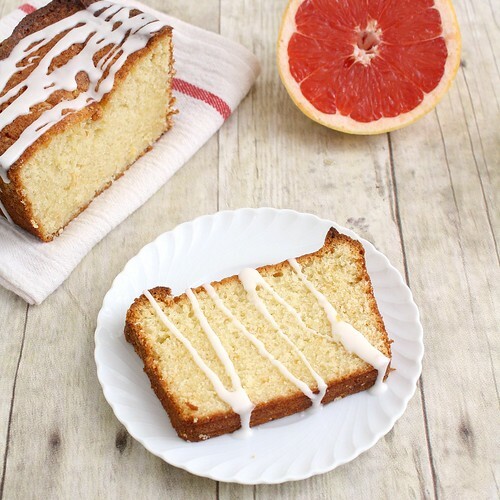 27 Responses to "Glazed Grapefruit Cake"
Tracey this sounds delish! Beautiful pics, too. And I love the wood surface underneath you’re using. So pretty! LOVE grapefruit! This cake sounds amazing, loving the glaze! How pretty is that cake! I love all things grapefruit!! What an awesome cake! This sounds lovely. How have I never noticed that recipe in Ad Hoc at Home?! I must make it soon! I love that you are hooked now. 🙂 Keep the great grapefruit recipes coming. This one looks like one I’d love. guh, I love everything about grapefruit but I hate everything about the fact I can’t ever eat any more of it. I was put on this medication at age 18 and since then I haven’t been able to eat grapefruit because it interacts with the medicine. Do you know how heartbreaking that is?! I was obsessed with grapefruit! Anyway, this cake looks and sounds sooo amazing, i just wish i could make this!! This looks absolutely fantastic, especially with the glaze on top. I have been seeing so many grapefruit recipes that I feel I should try at least some. So you pretty much just use one grapefruit for this recipe (not counting the syrup)? I was thinking about baking something with grapefruits because my mom brought a bag of them over. But I’ve been eating them. I think I have one left and I’ll make it this weekend for my future mother-in-law. She loves grapefruit. @Wendy – Yep, one grapefruit will do it if you skip the syrup. Hope she likes it! For the record (and for anyone else wondering), I did set out to make the syrup (before changing my mind) and needed 2 grapefruit to get enough juice for that. I, too, used to be a grapefruit hater. But then all of a sudden one day I started craving them. In fact, when I get really thirsty, I crave grapefruit juice above all else – so weird! Needless to say, I’ll be making this this weekend fo sho! Thanks! I’ve been meaning to try this recipe but was worried about the anti grapefruit people in the house. Now I really want to make it as yours looks delicious. Mmm, that looks delicious! I don’t make stuff with grapefruit often enough–I’ll definitely have to try this. I started out to make an orange-vanilla cake before settling on the citrus bars. It had a syrup, too, which I skipped due to laziness. I won’t skip it next time–my cake was okay, but I think it really needed that extra punch of flavor. I too am not the biggest fan of grapefruit, but this looks so pretty, I just might become a believer! I love lemon cake, so I think I could easily devour this, especially with that beautiful drizzle. I adore grapefruit! When I baked this cake, I made the syrup and it ended up pretty soggy as I recall. I’m glad to see how fabulous the cake is without the syrup; I’d probably go that route next time. I’ve had this recipe flagged since I received Ad Hoc and I still haven’t made it! Your cake looks absolutely perfect: simple and elegant. I love grapefruit; I need to make this before citrus season ends! This really does sound good. I wonder if lemon recipes could be converted to grapefruit, since they both need some sugar to sweeten them up. These humble cakes are some of my all time favorites. I love the idea of baking with grapefruit. I’ve never tried it before. I’m saving this to try later. I just love the way it looks, so fresh and perfect for spring, beautiful pictures! This cake was great! I made it yesterday. Not as grapefruit-y as I expected but the flavor was just enough to make it a little different from your traditional pound cake. I just wanted to let you know that I posted this on my brand new blog, with pictures too, so please feel free to check it out! Just finished turning this lovely recipe into an Easter cupcake delight. Went with the syrup, ’cause I wanted the grapefruit to be so strong folks might think they needed a serrated spoon to eat it. Loved ’em. Even my daughter who hates all things fruit loved ’em. Thank you, thank you.